The purpose of this Essay is to provide investors and practitioners with a realistic overview of the strengths and limitations of international arbitration in China. 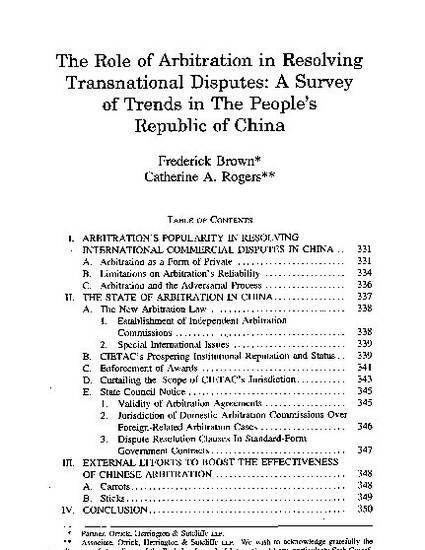 Part I of this Essay provides some general comments about the economic, social, and cultural reasons why arbitration is a popular choice among both international investors and Chinese nationals. Part I concludes that arbitration can only provide a partial solution to the ills of China’s legal system. Part II examines how the observations in Part I manifest themselves in recent developments affecting arbitration in China. Part III examines the range of efforts by foreign investors and the U.S. Government to diminish and eventually remove limitations on arbitration in China.